The Obama talking while touring cure for world problems. How's that working out? ZZZzzzzzz.... And now, while we wait for Joe the Plumber to deploy the Roto-Rooter to remove that look from FLOTUS' face, some "traveling music:"
I'm feeling quite wonderfully free. But it's something to do with the night. 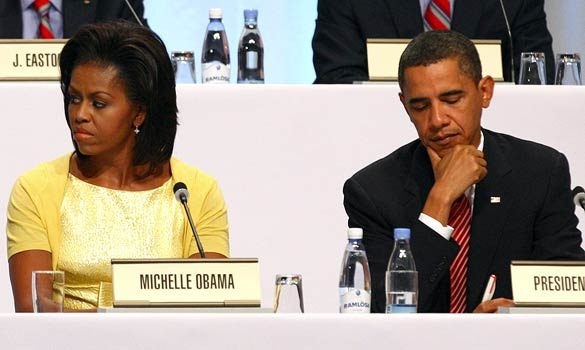 Who is Michelle giving the stinkeye to this time? WTH: You and every other hard working, tax paying American. To expand on that thought, there is nothing gracious or warm about her unlike Laura Bush who always appeared modest, humble and lady-like. He's probably dreaming about her great arms. I wish they would of stayed there! Could of SAVED this country TRILLIONS!! The down-side is that his black eye is also America's. At least this knucklehead wasn't trying to push Detroit on the IOC. To expand on that thought, there is nothing gracious or warm about her unlike Laura Bush who always appeared modest, humble and lady-like. She looks mean.